Paris — A nine-year-old South African child born with HIV has been able to control the virus without drugs for 8.5 years, scientists have reported. This is the first case in Africa. The child was diagnosed at one-month-old and was put on anti-HIV treatment and has now suppressed the virus. 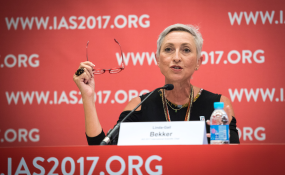 The report was released on Monday during a presentation at the 9th International Aids Conference on HIV science in Paris, France. This is the third case to be reported in the world of sustained HIV remission in a child after early limited anti-HIV treatment. Previously, the Mississippi Baby born with HIV in 2010, received anti-HIV treatment beginning 30 hours after birth, stopped therapy around 18 months of age, and controlled the virus without drugs for 27 months before it reappeared in her blood. In 2015, researchers reported that a French child who was born with HIV in 1996, started anti-HIV therapy at three months and stopped treatment between ages five to seven years and continued to control the virus without drugs for more than 11 years. “This new case strengthens our hope that by treating HIV infected children for a brief period beginning in their infancy, we may be able to spare them the burden of having lifelong therapy,” said Dr Mark Frederic Cotton, a paediatrician in South Africa and lead author of the study. He said early treatment will also save children from health consequences of long term immune activation typically associated with HIV. The South African child was diagnosed with HIV in 2007 at 32-days-old and was then enrolled in the early anti-retroviral (ART) clinical trials late or early for 40 or 96 weeks. “Before starting treatment, the child had very high levels of HIV in the blood but after the beginning of the anti-HIV drugs at about nine weeks, treatment suppressed the virus levels to undetectable,’’ said Dr Cotton. The scientists halted treatment for 40 weeks and closely monitored the infant’s immune health and the child, according to Dr Cotton remained in good health during years of follow up and examinations. Tests done at 9.5 years found signs of the virus in a small number of immune cells but otherwise found no evidence of HIV infection. The child, according to the researchers, has a unique weak immune system. It means there are not enough immune cells for the virus to infect and destroy to proliferate itself. They also have lower levels of CCR5 cells. The virus accesses cells through this protein. “The gate path that the virus use when entering the body is very small and would not allow it to get through. There is no replication of the virus,” said Dr Cotton.